Empire State Building, NEW YORK– Nine students, just under two percent of the student body, received consequences from the Honor Council last semester, according to a report issued by Dean of Students Dean Leedy. This is the first time the council has publicly released hearing results. The hearings involved cases of physical threats to a student, repeat noise infractions in housing, repeat visitation violations, underage drinking, possession of alcohol in housing and serving alcohol to underage students. The majority of offenders were first-year students, which has been typical in the past, Leedy said. However, Leedy noticed a “significant shift” last semester. The Honor Council placed eight students on disciplinary probation, removed two students from leadership roles on campus and required one student to complete an alcohol education program. In one case, the Honor Council suspended a student with multiple infractions. Suspensions and probation usually last one semester while removals from leadership vary. Suspensions, probation and removals from leadership are almost always temporary. Only cases involving illegal activity and potential harm to the King’s community are immediately elevated to the council. Third offenses, which require a meeting with Leedy, are passed to the council as Leedy deems necessary. The Honor Council consists of four students, one staff member and one faculty member for each hearing. The pool of representatives include: Jessica Lee (SBA), Ali Lane (SBA), Natalie Nakamura (Barton), Catherine Allen (QE1), Kristen Lee (ten Boom), Katie Darby (Thatcher), Tia Brown (Truth), Rosie Jonker (Truth), Burk Ohbayashi (Bonhoeffer), Jonathan Sheaffer (Churchill), Mike Medeiros (Lewis), Dan Woerner (staff), Christina Rogers (staff), Shelli Cline (staff), Dru Johnson (faculty) and Noel Rabinowitz (faculty). Adam Brill and Alex Ige (both Reagan) were recently added to the pool. Katie Darby (’12) attended two cases last semester and debated on the council for hours on one of those cases. Darby hopes students trust the Honor Council is not “out to get them.” She says the rulings may seem harsh, but students do not get to hear the deliberations or prayers behind their ruling. 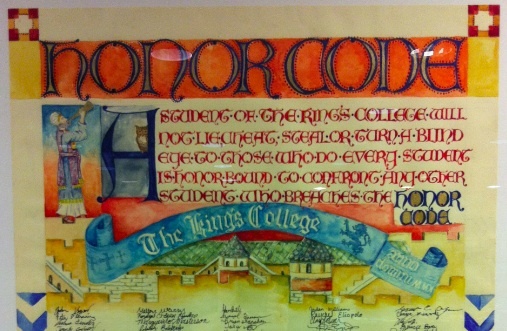 “We’re the reality that there’s consequences behind not following the Honor Code,” Darby said. “But we don’t want to just assign consequences. We want to see people improve. We’re really trying to come beside people and lift them up … and do what it takes to see that person better themselves." The second part of the Honor Code, to confront peers in the wrong, is what Vice President of Student Development Eric Bennett calls "the most important part." "If you don't get that piece, you won't have the strength to change society," Bennett said. He argues that friends should be the easiest to confront, while confronting future co-workers and bosses will require greater integrity. Bennett believes the changes Student Development have made to the honor system this year have successfully increased honor in the King's community. Those changes include House discussions of honor, letters explaining honor to incoming students and increasing the proportion of students on the Honor Council. "Thinking about honor has moved out from Student Development to other areas of the college," Bennett said. Director of Spiritual Life Ray East sees a correlation between honor and spiritual life and believes both have slowly and steadily grown over the past three years. East draws a distinction between cultural Christianity and Biblical discipleship. According to East, cultural Christianity is a mindset of the right doctrine, church and actions in order to live comfortably. Biblical discipleship is learning over a lifetime how to put God first and at the center of one’s life.